so--and i've said this before--every month or so i run through my favorite paranormal sites in search of new news or sightings or evidence or whatever in regards to the strange and the unexplained. i read ghost stories and ufo stories and stories of any bizarre creature that may have made an appearance but was somehow missed by my everyday radar. i then like to do a quick search on google using more definite terms like chupacabra, dover demon, mothman, aswang and a few others just to see if there's anything new on the subjects. sometimes yes, somtimes no. and every once in a while i'll run some of those same words or terms on ebay. you might remember that a few months ago i bid on--and won--a beautiful hand-painted tin piece from mexico featuring the chupacabra. anyway, big fun. 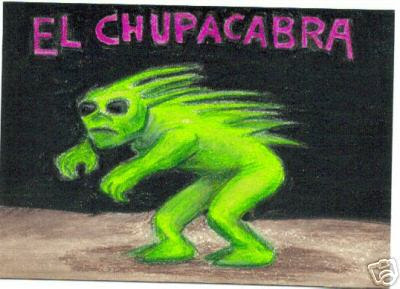 well, here are two more chupacabra-related items that i thought looked kinda cool and i oughta share. 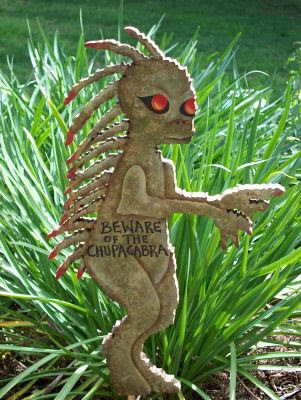 the first is a chupacabra lawn ornament, hand-made and ready to keep any small critters that don't want their blood sucked out of 'em away! the second is a work of art that is about the size of an index card. it's a really neat image and they say that the scan doesn't do it justice--but i really, really like it. 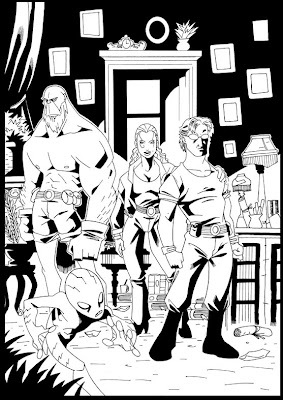 and finally, one of my myspace pals, mark zanini from brazil, sent me this awesome pic he did of our perhapanauts! well, some of 'em! thanks so much, mark! as we've said, craig and i are always thrilled to see someone else's handle on our guys and this is waaaaay cool! It's hard to believe that Choopie isn't a bigger star with all the interest out there in his people. Now on to 5 for Friday. 2. Jeff Goldblum - Into the Night is one of my favorite films. 5. I could only remember two of the stars of What Dreams May Come, but couldn't put either of them in Dead Again, so this is a ? for me as well. I just IMDB'd the last one... interesting. 2. death wish, into the night, the adventures of buckaroo banzai across the eighth dimension John Lithgow? I've seen nine of the fifteen and would highly recommend "Into the Night."